Any choice you make -- any decision -- will benefit from 10-10-10. We all want to lead a life of our own making. But in today's accelerated world, we can easily find ourselves steered by impulse, stress, or expedience. Are our decisions the right ones? Or are we being governed, against our best intentions, by the demands of the moment? A transformative new approach to decision making, 10-10-10 is a tool for reclaiming your life at home, in love, and at work. The process is clear, straightforward, and transparent. In fact, when you're facing a dilemma, all it takes to begin are three questions: What are the consequences of my decision in 10 minutes? In 10 months? And in 10 years? Recounting poignant stories from her own life and the lives of many other dedicated 10-10-10 users, Suzy Welch reveals how exploring the impact of our decisions in multiple time frames invariably surfaces our unconscious agendas, fears, needs, and desires -- and ultimately helps us identify and live according to our deepest goals and values. 10-10-10's applicability is uniquely broad and has shown its effectiveness in decisions large and small, routine and radical, consistently changing lives for the better. 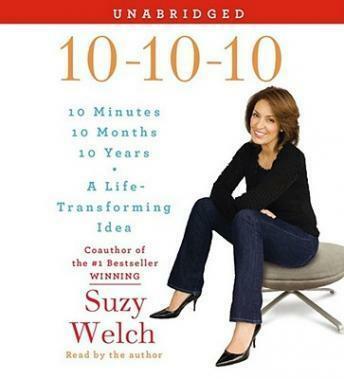 In this immensely useful and revelatory program, Suzy Welch fully explains the power of 10-10-10, a transformative idea that can replace chaos with consistency, guilt with joy, and confusion with clarity.